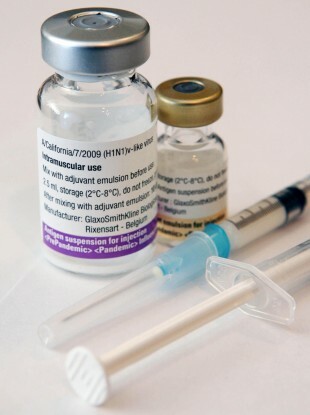 File photo dated 02/11/09 of Pandemrix vaccine as the swine flu jab which was given to hundreds of thousands of children carried an increased risk of developing the sleep disorder narcolepsy. A GROUP REPRESENTING those suffering from unique narcolepsy disorder has organised a march in Dublin today to the Department of Health over the failure by government to put supports in place a year after a commitment by the minister to do so. Sufferers of Unique Narcolepsy Disorder (SOUND) will walk from St Stephen’s Green Park to the Department of Health at Hawkins House at 1pm today, where representatives will hand over a letter addressed to Minister for Health Dr James Reilly. The group represents 54 children, adolescents and adults diagnosed who have the disorder as a result of vaccination with swine flu vaccine Pandemrix, which was given as part of a State sponsored and promoted campaign. The action today, takes place on the anniversary of the release of a report by the National Narcolepsy Steering Committee, which found that there was “a significant 13-fold higher risk of narcolepsy in vaccinated compared to unvaccinated individuals”. Following the publication of the report, Reilly said that a package of supports would be brought to government for approval prior to the summer recess last year. Now a year since the report was published, children and young adults who developed narcolepsy as a result of vaccination with Pandemrix, have no permanent support package in place and SOUND said the Minister for Health “refuses to meet with parent representatives to advise why the delay has been encountered and what the eventual package might comprise”. In the letter, which will be handed into the department today, SOUND provides a list of suggestions for supports. They include an awareness campaign for medical professionals and the public, access to rapid diagnosis, a special services medical card, continuing educational supports, access to new drugs treatments and compensation. The group is also calling for official recognition of narcolepsy as a disability so that members cannot be discriminated against in the workplace and will be entitled to Disability Allowance if they are forced to stop working. Email “Narcolepsy sufferers plan march on Department of Health over lack of supports”. Feedback on “Narcolepsy sufferers plan march on Department of Health over lack of supports”.